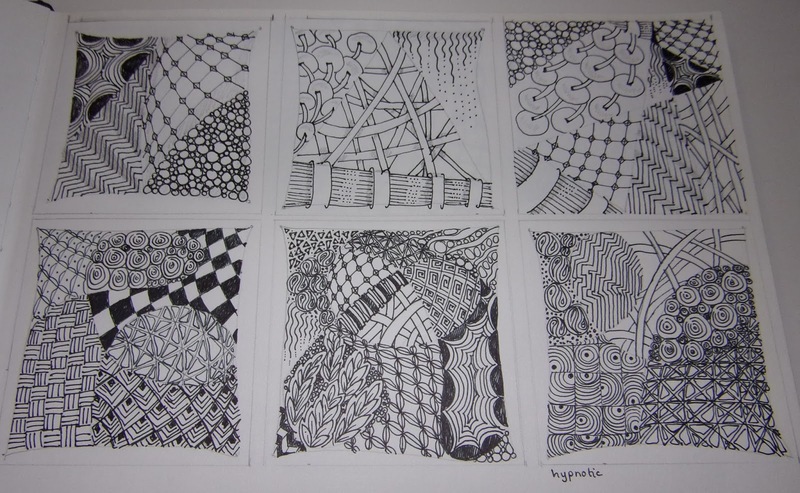 I have always enjoyed doodling - just drawing patterns on scraps of paper, letting my mind wander. I have given in and tried Zentangle, which is the next stage on to just doodling. 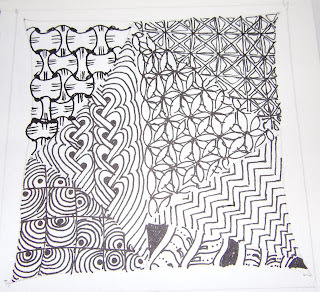 Zentangle is a way of filling in shapes with repeating patterns, but the patterns can be as simple or complex as you like and the whole process is supposed to be relaxing and meditative. 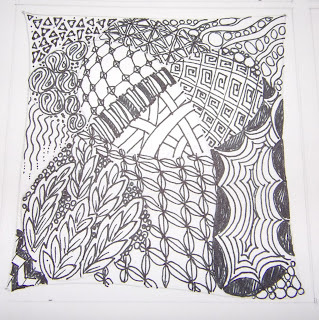 Each of the patterns has a name and there are hundreds and probably thousands to choose from. I started by following a book, but the internet has a plethora of information on there. 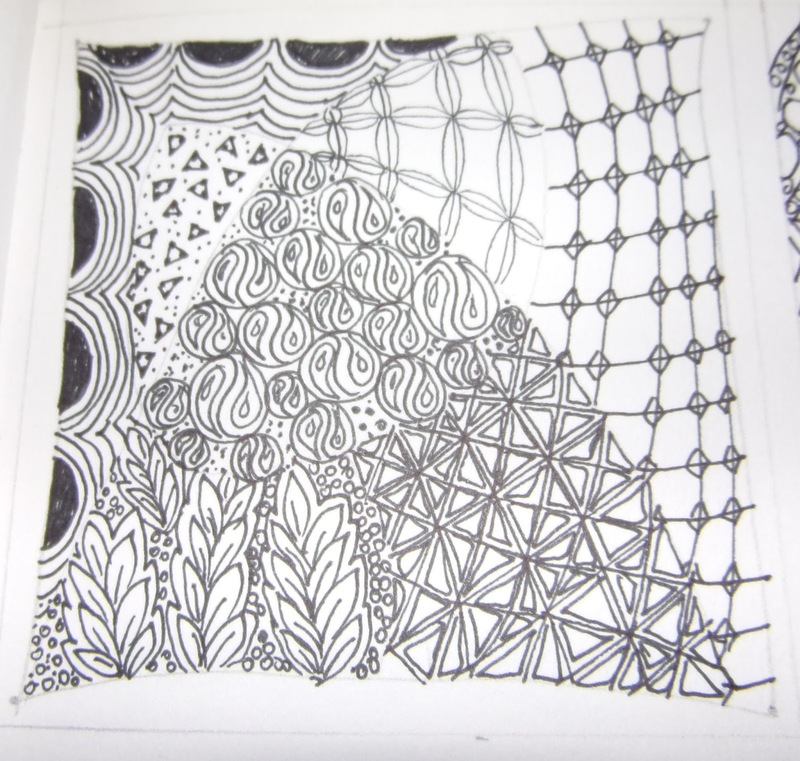 I do like the organic patterns, but I also enjoy building up a simple pattern into something which looks incredibly complicated. However, when the patterns are broken down into steps, they seem relatively easy to do. It is a relaxing process and there is no right or wrong (however, me being a bit of a perfectionist, had to re-do a pattern which didn't fit well into the space I had put it and I was much happier with a second attempt). The other good thing is that you begin with a square, then split it into shapes and then fill each shape, so you are not greeted with a huge sheet of white paper, which can be a little off-putting. It is also something that can be done in a spare minute, without lots of equipment - paper, a smooth gel pen, and a ruler and pencil. Are you tempted yet? Thanks, Amy. 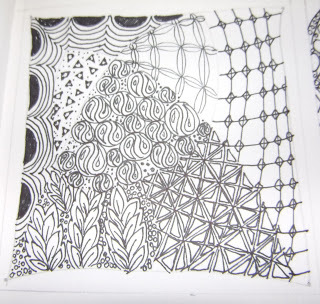 Yes, I think you could create the whole pattern and then colour it in. 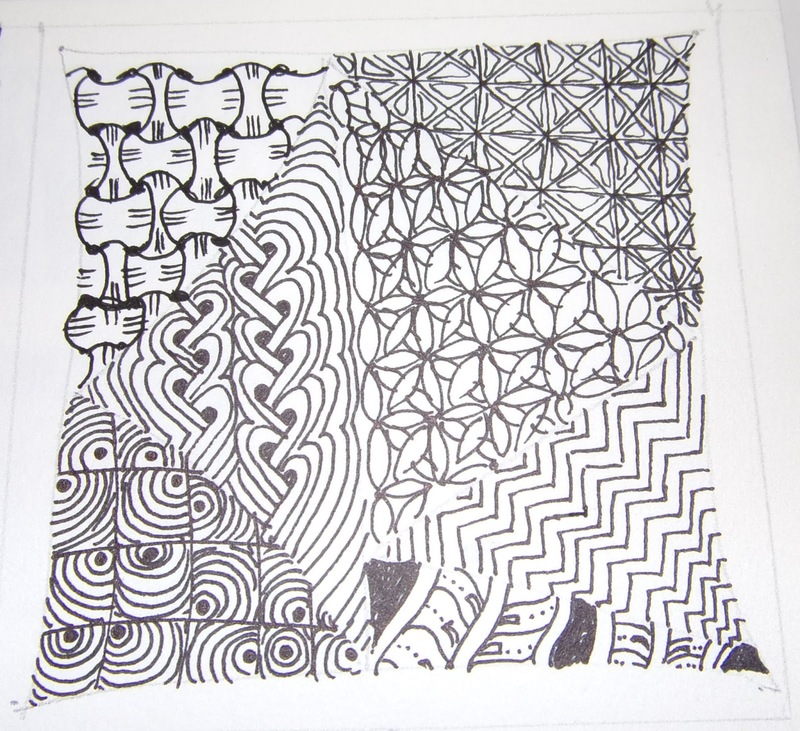 It could take a while depending how complex the pattern was, but that's the point, isn't it, to relax and enjoy it! I have seen some incredible work done with it. And my wobbly hands means that it is beyond me. Love the snippets you have shown us. Thanks, EC. I don't think I shall aim to become a 'master' in it (like some amazing artists out there), but I am enjoying what I'm doing. This is such a nice thing to do, isn't it? Son and I did it a while ago and it was fun! Enjoy your self :-)! Love from Mirjam. Thanks, Mirjam. 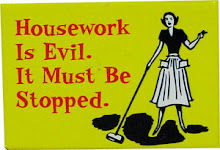 It is a nice thing to do, you are right. I do find it very relaxing and really like the way you can do a bit, then put it down and come back to it when you have a few minutes. I am enjoying it! I enjoy zentangling too - although I prefer to have a picture rather than just a square/tile to complete. Your patterns are lovely.